There are three main hoop types that are available for purchase. These three types are portable, in-ground, and wall-mount. We will now break down each type so that you will have a greater understanding of the pros and cons of each option. Likely the most popular basketball hoop type today as far hoop choice and number of hoop purchases. Portable basketball systems generally come with a base that can be filled with either sand or liquid which keeps the unit in place and stable. These can range greatly in size and capacity from 27 to 42 gallons. Some larger hoops will also have space to place bricks and other materials to help weigh down the basketball system. Portable hoops are a great choice for most homes as they are easy to transport and easier to install than in-ground options. The draw back to portable hoops is that especially at the cheaper level these hoops will shake and vibrate more than more heavily supported hoops that are attached to a wall or supported by concrete in the ground. Generally in-ground hoops are significantly more stable than portable systems. This is because many of these hoops’ support poles are placed into the ground with concrete. 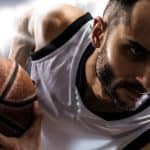 We recommend these hoops for serious players wanting to get serious about their game who have a stable living situation and are unlikely to move. If you are moving often, then a portable hoop will likely be a better fit for your home. 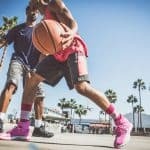 It is important to note that because in-ground hoops require concrete installing these hoops so that they are level can be more complicated than just assembling a portable hoop. Probably the most important piece of the hoop’s hardware is the rim as it comes into play on almost every shot. Almost all modern hoop systems come with some sort of breakaway mechanism that helps to relieve tension on the hoop when dunked so to minimize the risk of breaking the backboard. The most basic rim that comes with recreational basketball hoops is the standard rim. Standard rims have been around for decades and used to be used on all basketball hoops. Ever since spring loaded breakaway rims came into existence standard rims are not used as often. These days standard rims are found primarily on low priced portable basketball hoops. Because they do not have a breakaway mechanism, standard rims have a tendency to bend, warp, and break when dunked. On the plus side, if you use them just for layups and regular shots they are decent depending on the quality of the system’s other components. 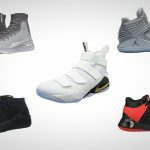 Generally found on mid-tier and top-tier basketball hoops, enclosed spring breakaway rims are the top shelf of basketball rims. However, not all are made equal. An enclosed spring rim found on a $500 hoop will not have the same quality found on a $1500+ in-ground hoop. One will be good, while the other will perform like the hoops found in professional arenas. This is generally due to the materials used, spring quality, and design. Springs on these hoops are enclosed in a metal cover so that they are not exposed to the weather elements helping them last longer. There are three main types of backboards to choose from and these include: polycarbonate, acrylic, and tempered glass. Polycarbonate backboards tend to be common on less expensive basketball hoops. This is actually a type of plastic that is rigid and can hold up to mother nature quite well. On the down side, the performance of polycarbonate on backboards is often less than stellar. You will notice when using a polycarbonate backboard that the ball does not come of the board with much force, which in part can be attributed to a lack of brace support provided in cheaper hoops. However, for someone just looking for a recreational hoop for the family, a polycarbonate backboard will likely meet your needs. Backboards made with thermoplastic acrylic will generally perform better than their polycarbonate counterparts. This is why many middle-tier hoops come with an acrylic backboard, which makes acrylic a great choice for the majority of basketball system purchasers. The quality and durability is evident when playing on an acrylic hoop as the ball will come off the board with more bounce. Finally, we have the mother of all backboard materials, which is tempered glass. While acrylic and polycarbonate are both forms of plastic, tempered glass is the real deal and is used in gyms across the country. That is why this type of backboard will provide the most refined performance available. Because tempered glass excels in backboard performance it should come as no surprise that it is also the most expensive backboard material available. 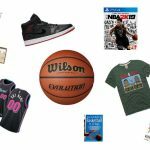 This will suit advanced players who are very serious about their game and intend to spend many hours honing their skills. The only downside to tempered glass is that it is far less durable than polycarbonate and acrylic. 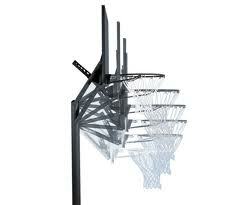 This means that if your portable hoop happened to tip over during bad weather or a dunk then the glass could shatter. Backboard sizes also vary and can be in one of two shapes: fan or square. Most basketball hoops today do come with a square backboard which offers a greater surface area for missed shots to hit. 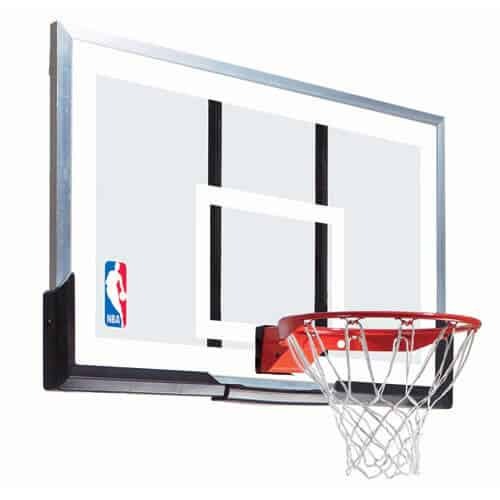 Square backboard come in sizes from 42 inches to the regulation 72 inches. Remember, larger backboards are generally more expensive depending on the material. Pro Tip: Check to see if the hoop you are interested in comes with backboard padding as this makes play safer for everyone! Support poles come in three different designs: three-piece, two-piece, and one-piece. This means that a three-piece support pole literally uses three different pieces of metal to make up the support pole, while a two-piece support pole uses two pieces, and a one-piece support pole uses one piece. The bottom line when it comes to support poles is that the less pieces a support pole has the more stable it will be. So one-piece support poles are found exclusively on top of the line in ground hoops. While two-piece support poles are found on top of the line portable hoops and mid-tier in ground hoops. Three-piece support poles are found on cheaper portable basketball systems. Hoop with three-piece support pole. Hoop with two-piece support pole. 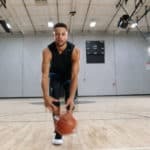 Less expensive basketball hoop options tend to have a brace that helps to adjust the hoop’s height positioned at the center of the system. The highest performing hoops will have a thicker support pole and additional bracing the encompasses most the backboard playing area which reinforces stability for shots. Because budget hoops do not have this bracing shots that hit the left and right sides of the backboard tend to come off dead compared to when they hit the middle of the board where the majority of the hoop’s support is supplied. Pro tip: Look for hoops with padding on the support pole and powder coating to help prevent rust. Almost all of today’s portable and in-ground hoops feature some sort of height adjustment mechanism. Previously, you needed a broom handle to adjust the height of hoops, however, most often basketball systems today come with a handle or crank mechanism that makes height adjustment easier. Some of the least expensive options available still use a telescoping system where you can place a bolt through the support pole at various increments. The most common adjustment range for hoops are 7 and a half feet to the regulation 10 feet. Yet, there are some hoops that have a greater range than this. Be sure to check the specifications of the specific hoop you are interested in to get an idea of it’s height adjustment range and adjustment mechanism.